Experiment. 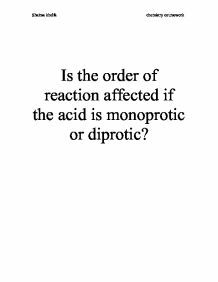 Is the order of reaction affected if the acid is monoprotic or diprotic? 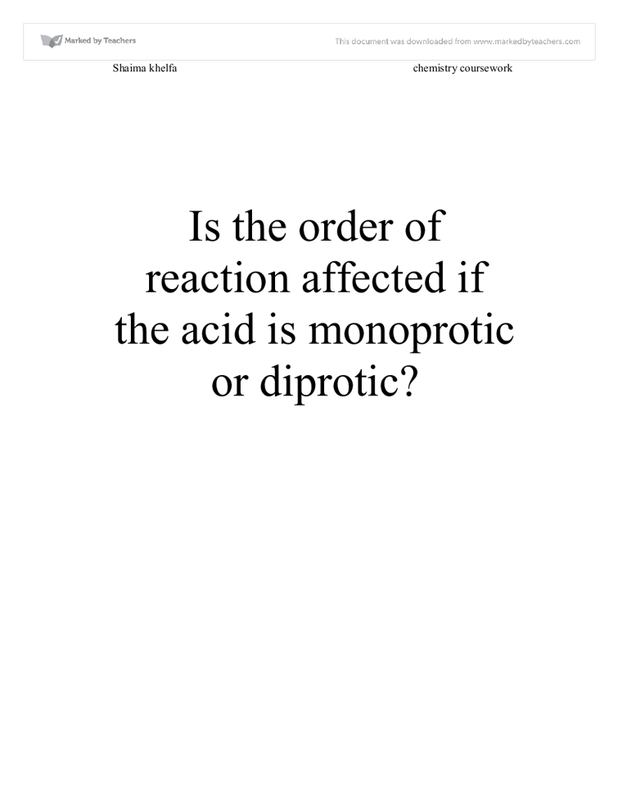 Is the order of reaction affected if the acid is monoprotic or diprotic? In order for a chemical reaction to occur, particles must collide with each other. The particles have to collide with enough energy for bonds to be broken (needing energy) and new bonds to form (releasing energy). If the particles react with each other, the collision is said to be successful. If you increase the concentration of the reactants this will mean that there will be more particles available, therefore these particles will be likely to collide with each other more often, thus increasing the rate of reaction. A monoprotic acid can only donate or lose one H+ ion i.e. they only have one dissociable proton. 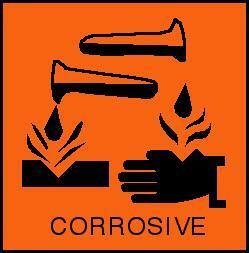 The acid that I will be using in my investigation that is monoprotic is Hydrochloric acid. A diprotic acid however has two dissociable protons. 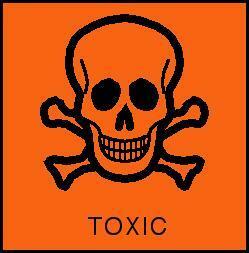 An example of this type of acid is sulphuric acid. This is an acid dissociation constant which is a measure of the strength of acid in solution. - Ka equals the equilibrium concentration of the deprotonated ion A- multiplied by the equilibrium concentration of H+,divided by the equilibrium concentration of the acid in the form of HA. By looking at the above dissociation equations, the hydrochloric acid is fully dissociated and therefore there is no ka value for it, however for the sulphuric acid it has two dissociations and therefore will have a ka value. will enable me to get many readings and thus allow me to process my data into graphs in order to help me workout the orders of my reactions. However it can also be very slow and time consuming. -Another method that can be used is the time taken for the metal to completely dissolve in an acid solution. This would have to be repeated at various concentrations for the different types of acid. -And finally, the time taken for a certain volume of hydrogen to appear. This would also have to be repeated at various concentrations. When measuring the volume of gas produced, the initial results can be inaccurate because some gas is lost whilst putting the bung on the flask. Reactions can be categorised as zero order, first-order or second-order. These can only be determined experimentally, not theoretically. When a reaction is said to be zero order it means that the rate of the reaction is not dependant on the concentration of the reactant, i.e. 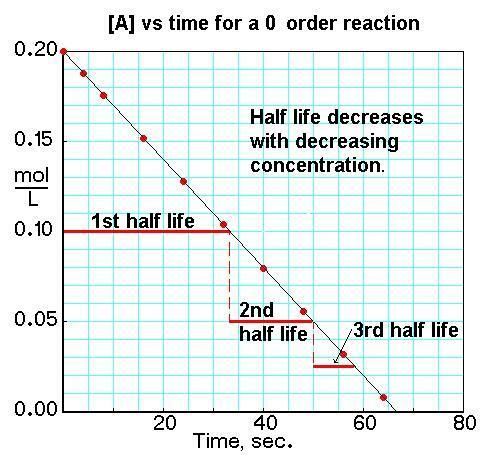 changing the concentration has no effect on the rate of the reaction and therefore the half-lives will not be increasing. The units of the rate constant in a reaction that is zero order would be mol dm-3 s-1. Example of a zero order reaction. When a reaction is said to be 1st order this means that the rate is directly proportional to the concentration of one of the reactants. In this case, the half-lives will be constant. The units of the rate constant in a reaction that is 1st order is s-1. Example of a first order reaction. Finally, when a reaction is said to be 2nd order this means that the rate of the reaction is directly proportional to the square of the concentration of the reactants. In this case, the half-lives will be increasing and the units of the rate constant are mol-1 dm3 s-1. Example of a second order reaction. From the above mechanism I conclude that it is 1st order with respect to A and zero order with respect to B.
Hydrogen ions migrate to the metal surface. Hydrogen ions accept electrons from the metal surface. Metal ions hydrate and diffuse away from the metal surface. However for steps 1 and 4, chemical equations are not possible. The order of reaction may vary in my experiment because I am using a monoprotic acid and a diprotic acid, and therefore it may be predicted by looking at the chemical equations for the reactions that the sulphuric acid would have a second order reaction (because it has 2 H+ ions) and the hydrochloric acid would have a first order reaction. However when you simplify the chemical equations they will both be Mg + 2H+, and this tells us that they both have the same number of H+ ions and therefore the same order of reaction, which may be expected to be second order. During my pilot study I took in consideration that the reaction that should be achieved at the end should not be very slow as it will be time consuming nor should it be too fast so I could obtain as much data as possible inorder to process my results into graphs and work out the order of the reactions, (it should take approximately 5 minutes for each reaction). I have decided to investigate the order of the reaction using a monoprotic acid and a diprotic acid, such as hydrochloric acid and sulphuric acid. The simple approach that I firstly took was to collect and measure the volume of hydrogen gas produced over measured time intervals. I was aware that the initial concentration of the acid is reduced during the experiment, the concentration therefore may then be unlikely to remain constant during the measured time, and hence I need to calculate the amount in moles of the acid that will be used and from this the mass of magnesium. In my case the reactant that will be in excess will be the magnesium metal. Mg + 2HCl → MgCl2 + H2, so 1 mol of Mg reacts with 2 moles of HCl to give 1 mol of hydrogen. I then decided that I will use 10cm3 of acid and of concentration 1 Mol dm-3 and to use Magnesium powder. I now need to work out the moles of acid and from that the mass of magnesium. When I carried out the trail experiment I noticed it was a far more fast experiment than expected. The next simple approach I took was that I was aware that the magnesium powder reacts more quickly than the magnesium ribbon, therefore I will change to the magnesium ribbon using the same volume and concentration of acid. When the reaction was carried out it was slower however not as slow as wanted as it only took approximately 2 minutes for the reaction to end. I also noticed during the reaction I carried out so far that the reactions produce there own heat whilst reacting, so this factor could have effected how fast the reaction took. The only possible thing to do is to place the reaction in a 20oc (room temperature) water bath to keep the temperature constant. However I will also need to change the concentration of the acids inorder to slow down the reaction. The next concentration that I will do a trial on is 0.5 mol dm-3. After I calculated the mass of magnesium that I will use, I carried out the experiment along with the modifications. I obtained enough results at different time intervals that will allow me to process my results in way that I could calculate the orders of reactions. In my investigation, I have chosen to carry out the continuous method, this is a more efficient method and will enable me to get a lot of readings thus allow me to process my data into graphs inorder to help me deduce the orders of my reactions. A gas syringe inorder to collect the hydrogen gas that has evolved in the reactions. This was used because it was the most practical and convenient. Boiling tubes and rubber bung. Measuring cylinder. This will be a fairly accurate way to measure the 10cm3 of acid because it would be too time consuming to use a pipette in every experiment I carry out. Balance- 2 decimal places for more accurate mass measurements. Set up a stand and clamp then attach a gas syringe to the clamp. Use a rubber wire to join the gas syringe to a boiling tube. Place the boiling tube in a 20oc water bath. Measure 10cm3 of the acid you will start with using a measuring cylinder and pour in the boiling tube. Then measure out the mass of Magnesium ribbon needed using a balance. Cut the magnesium ribbon into small pieces so they would fit in the boiling tube attach the rubber bung as quickly as possible so gas is not lost. Use a stopwatch to time the volume of gas produces at different time intervals. Carry the same steps again using the hydrochloric acid and the sulphuric acid and the amount of Magnesium needed for that acid. When I obtain my results I will then process my data into graphs. 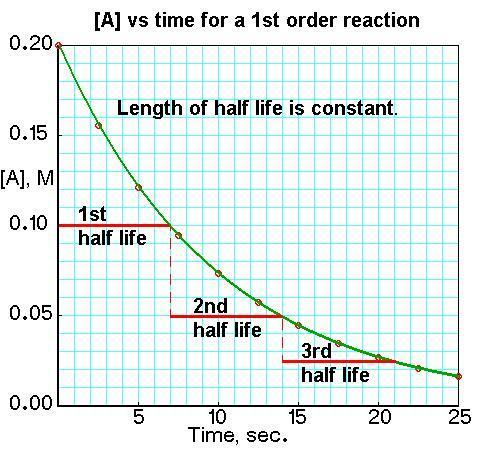 One of these graphs will be used to deduce the order of reaction by making three consecutive half lives and then use the values to deduce the order of the reaction. The other graphs will be used to include the error bars to measure the accuracy and reliability of the method I carried out and therefore see if my data is trusted. For the above reaction, I will be using in my experiment 10cm3 of Hydrochloric acid at a concentration of 0.5 mol dm-3. To find the mass of Magnesium that I will be using I will firstly need to find the moles of the moles of the acid. Now that I have found the moles of the acid, I can find the moles of the Magnesium. According to the above equation the ratio is 1:2, therefore I will have to halve the moles of the acid to get the moles of the Magnesium. The relative molecular mass of Magnesium is 24. This will be used to work out the mass using the moles I calculated. Mass = 0.0025mol x 24.3 = 0.06g. The mass of Magnesium that I will need to use according to the above calculation is 0.06g; however, I will need to use the Magnesium in excess. Therefore, the mass of Magnesium I will be using throughout my experiment is 0.17g. I chose this specific amount because I want to increase all my Magnesium masses throughout the investigation by three times for more accuracy and reliability. For the above reaction, I will also be using 10cm3 of Sulphuric acid at a concentration of 0.5 mol dm-3. To find the mass of Magnesium that I will be using I will firstly need to find the moles of the moles of the acid. According to the above equation the ratio is 1:1 therefore I will not have to do any calculations because the moles are the same. Again, this will have to be in excess, I chose to increase the mass by three times, and that will equal to 0.40g. As stated on all above calculations the reactant that will be in excess is the magnesium metal, this is because I do not want it to be a limiting factor in the experiment. During my investigation, I will have to take in account that as well as changing the amounts of reactants I will also need to control and maintain certain things unchanged so no external factors effect the rate of my reaction. Therefore, I will need to control the temperature of the reaction taking place because the reactions that I will be carrying out produce its own heat whist reacting with each other. As a result, I will be placing the boiling tube where the reactions will be taking place in a 20oc water bath throughout the experiments. This will ensure me that no other factor except concentration will effect the rate of my reactions. I will also be controlling the volume of the hydrochloric acid and sulphuric acid. Throughout the experiment I will be using 10cm3 of the acids to react it with the magnesium metal. curled up so it could fit in the flask along with the acid in order to react fully. Table of volume of hydrogen produced in a reaction of HCl with Magnesium at different time intervals. Table of volume of hydrogen produced in a reaction of H2SO4 at a concentration of 0.5 mol dm-3with Magnesium at different time intervals. Throughout my calculations I have used an experimental Vf value instead of a theoretical Vf value, this is because it will allow me to produce more reliable predictions as it is the value that I have obtained during the experiment s and not from calculations. Also the theoretical value will give me numbers that are usually different from the real experimental value. I obtained the VFvalue experimentally from the final experimental result in the raw data. made three successive half lives by marking a line across and downwards for each. The order of reaction is then deduced by calculating the time in seconds it increased by. Below are the results of my half life graphs for the monoprotic and diprotic acid. The orders of reaction for both the acids seem to be zero order this means that the rate of the reaction is not dependant on the concentration of the reactant, i.e. 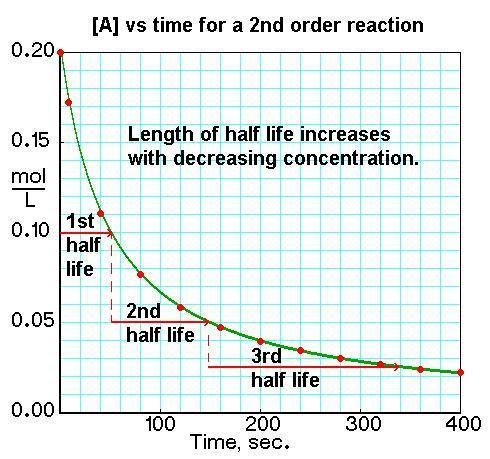 changing the concentration has no effect on the rate of the reaction and therefore the half-lives will not be increasing. Therefore the units will be mol dm-3 s-1. The above percentage error show me that the accuracy of the equipments that I have used in order to produce enough data to work out the order of the reaction. The volume of the acids was measured using measuring cylinder; the overall percentage error that may have occurred when I was measuring was 2%. This error does not seem to be significant and therefore would not make my results unreliable. The volume of the gas was measured using a gas syringe; this equipment has an average percentage error of 1.77%. This also shows me that it was not very significant error and would therefore not effect the precision of my results. I measured the mass of magnesium metal using a balance, this had an average percentage error of 2%, this is also thought to not be significant and therefore will not effect the precision of my results. The overall accuracy of my equipments seems to not be significant and therefore do not effect the precision of the data I obtained; however they are not 100% accurate. The main sources of error that may have occurred during my experiment is the fact that gas escaped at the start of the experiment and also the main problem that occurred was how do you decide when all the magnesium have dissolved and hence how do you decide when the reaction have stopped. This might have effected my data as I might have increased the time for the reaction when it was not possible to notice. Observing the raw data that I have obtained, it is clear that for the reaction of hydrochloric acid with magnesium the two trail data were approximately close to each other. For example for the first set of data at 30 seconds, I obtained 14 cm3and 11cm3 for the second trial. This shows little difference but may suggest that in trial 2 more hydrogen gas may have escaped at the start of the experiment than the first trial and therefore produced a lower result. This source of error has caused all the second trial results to be about 5cm3 less than the first trial. For the reaction of sulphuric acid with magnesium the raw data seems to be more accurate and close to each other. For example for the first trial at 10 seconds the volume of hydrogen was 30cm3 and for the second trial it was 32cm3, this only shows that there was a slight more in the second trial which may have occurred because I was able to place the bung in the test tube more quickly than in trial 1. however, at 40 seconds the volume of the hydrogen became the same, 72cm3, this may have been due to human errors; the fact that I was not able to concentrate on measuring the volume and also the time at the same time. After 40 seconds the values then changed. At the final timing, 110 seconds, the values were the same again. The qualities of my mean results also seem to be fairly accurate as I was able to fit all the mean results together in a curve. This suggests that there was a pattern in the increase of the volume of hydrogen as time increases. Overall I believe that the results I obtained were mostly valid but not 100% perfect or trusted because of the human error and experimental errors that have took place. Wear goggles and lab coat at all times. Eye contact: immediately flush the eye with plenty of water for at least 10 minutes. Skin contact: wash off with plenty of water and remove any contaminated clothing. Eye contact: immediately flush the eye with plenty of water for at least ten minutes and call for immediate medical help. Skin contact: wash off with plenty of water and remove any contaminated clothing. If the skin reddens, seek medical advice. Magnesium chloride causes no unusual hazard. Wear goggle and lab coat at all times. Eye contact: immediately flush the eye with water. If irritation persists, call for medical help. Skin contact: wash off with water. Contact with eyes can cause irritation. Always wear goggles and lab coat. Eye contact: immediately flush the eye with plenty of water. If irritation continues, call for medical help. Hydrogen gas is handled with at all times throughout the experiment; therefore care must be taken as it is flammable. Precautions should be made by wearing goggles at all times and not use fire near it. Glassware should also be taken in consideration at all times when using them. 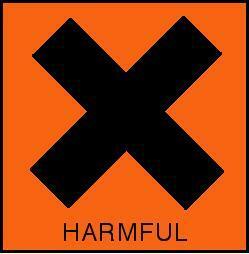 Test tubes are breakable and may result in injuries. This student written piece of work is one of many that can be found in our AS and A Level Physical Chemistry section. How do we make Magnesium and Hydrochloric acid react faster? Experiment investigating hydrogen bonding in different chemicals. of the solution, which will have a great affect on the reliability of your results. Due to methyl orange being an acid, it will cause an increase in the amount of positive hydrogen ions being added, if a lot of this indicator was added; and so the minimum amount of this indicator is needed. = 0.023178532mol ?Initial temperature of water=25oC Highest temperature of water attained= 29oC ?Temperature rise= 4oC Mass of solution= 50g =0.05kg ???=mc?? ?????????? ?221)(1300)+(0.05)(4200)](4) =-851.492J ~-0.851kJ Energy change per mole of anhydrous magnesium sulphate(?H?soln [MgSO4(s)]) = -0.851492 /0.023178532 = -36.73623506 ~ -36.7 kJmol-1 3. The bonds are then reordered and reformed to form the products. Colliding particles are required to have a minimum kinetic energy, known as the reaction's activation enthalpy, before it is possible for them to react. Not all of the particles exceed this activation enthalpy and have the right orientation at the moment of impact to cause the reaction to proceed. 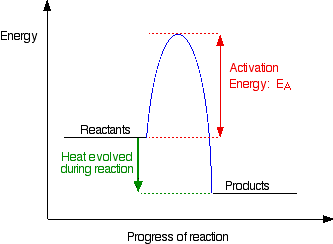 levels, meaning that they have more energy, so are more likely to have the activation energy required for the reaction to take place.1 1.4 - Order of Reaction and the Rate Equationii The order of a reaction describes the relationship between the concentration of a reactant and the rate of the reaction. my results as I am measuring the rate of reaction between hydrochloric acid and magnesium. I have considered these elements so they do not create anomalous results. Preliminary work: I practised a preliminary experiment and I found rudiments to my final experiment. By knowing the mass of magnesium oxide produced and the mass of magnesium used, the mass of oxygen can be determined. The ratio between the moles of Mg used and the moles of O consumed can then be figured using this data.